Gilbert Spencer’s family lived in Cookham, a village on the Thames just north of Maidenhead in Berkshire. His grandfather Julius Spencer, a builder, had two marriages and his father, William (1845- 1928), married a local girl, Anna Caroline Slack (1851-1922); as a result the family had more than seventy relatives in the village. Given the geography of the Thames on one side of the village and the commons and marshes on the other, there was a natural tendency to insularity and eccentricity. The isolation was ameliorated socially, to a limited but significant extent, by the presence in the neighbourhood of several wealthy and aristocratic families, in particular Lord Boston at Hedsor Lodge, the Duke of Westminster and later Waldorf Astor at Cliveden. At the turn of the century the Thames itself was the scene of social mêlée as the upper reaches became very fashionable for boating events –a trend reflected in the popularity of Three Men in a Boat and The Wind in the Willows. William’s professional life was concerned with teaching or playing music; he was the organist at the neighbouring village of Hedsor for over thirty years. Among his pupils were Lady Desborough, Lord Boston, Rosamund and Beatrix Lehmann and he taught astronomy to the two Lowy sisters who became Mrs Victor Gollancz and Mrs Harold Rubinstein. His exceptional intellectual capacity was fed by an energetic curiosity into the natural sciences, astronomy and literature and his memory was prodigious. A great talker and reader, a Liberal in politics, a high-minded Christian much influenced by the ideas of John Ruskin, hot-tempered and stubborn, his home reverberated with discussion and piano playing. Annie Slack, known as ‘Birdie’ for her fine voice, had sung in Grandpa Julius’ choir. She was also a natural mimic with dramatic flair – a trait inherited by at least one of her children[i] . Diminutive and very beautiful when young, Annie had thick springy black hair, dark eyes, a fine nose and a wide, full mouth. [ii] She was warmly sensitive to her children’s needs[iii], providing the absolute centre of their home. She seems also to have been a gregarious woman[iv] and as immersed in the Cookham community as her husband. William and Annie married in 1873 and lived in a very modest three-story semi-detached brick villa, Fernlea, built by Grandfather Julius on Cookham High Street[v]. William’s brother Julius and his family of daughters lived next door. Over the next twenty years William and Annie had eleven children, two of which died in infancy. “All those who survived were marked by a high degree of individuality and several of them by gifts of a rare order.” [vi] This was a church-going family: William was an unorthodox Anglican and Annie a Methodist. There was a great depth of knowledge of the Bible from daily readings and a critical appreciation of its literary beauties. William’s patriarchal demands had tragic consequences when his eldest son, Will, had a nervous breakdown from over- zealous study and piano practice. The family finances never recovered from the expenses of his convalescence but Will eventually had a quietly distinguished career as a professor of music in Germany where he married, but his father was forever disappointed. [vii] Annie, as the eldest girl in a Victorian family, had the most restricted life by being designated to nurse and then to teach the younger children and later to care for her aging parents but she too had musical talent playing the viola in an orchestra in Maidenhead. In another age, a satisfying career might have saved her from the mental deterioration for which she was eventually institutionalized. [viii] Harold studied the violin and became a working musician with light orchestras. Florence worked as a governess and also wrote articles[ix] married a Cambridge don, J.M. Image, but was prematurely widowed. Her compilation of family letters and reminiscences, Mosaic or A Mosaic of the War was written when Stanley was ill “to afford my brother a further degree of release and healing”. Percy’s ambitions to become a cellist were dashed when financial hardship struck and he was sent out into trade and then business. Gilbert lodged in the same house in London when, at 17, he first attended Camberwell College of Arts; Percy introduced him to his beloved London in all its Dickensian detail. During WWI Percy was given officer training at Cambridge and after the war he moved successfully into management of the building trade. Sydney became a divinity student at Oxford and it was his reading, particularly of John Donne, that fed into Stanley’s creativity at a critical time in his development. Tragically he died very near the end of WWI. The Spencer family character was forthright and energetic and undoubtedly their singularity, upon occasion, had comic touches. Nevertheless, their deep and uncompromising dedication to the study and practice of their several arts produced a forcing house of talent that propelled several of them from the upper reaches of village life and on to the national stage. Much, or in the case of Stanley and Gilbert, most of this ability was fostered in the home environment where the complex structures of music, the great cosmic ideas behind Christianity and the fabulous imagery and language of the King James Bible prevailed. In the pursuit of their individual careers the Spencer children, to varying degrees, significantly enriched the culture in which their parents had immersed them and from which they drew their creative strength. [i] “His (Stanley’s) mimicry and comic turns were very successful” A Private View of Stanley Spencer page 66. 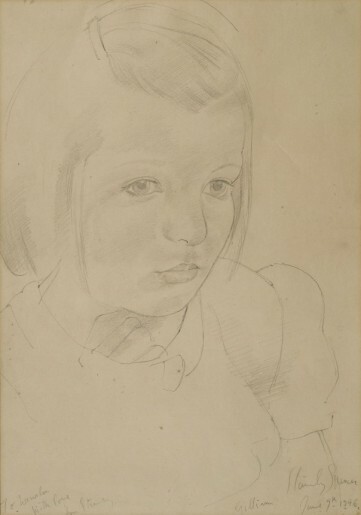 [ii] From a photograph of her when young pasted into the second version of the typescript Mosaic compiled by Florence Image (née Spencer), D/EX 801/30 at Berkshire Record office. [iii] “She was the perfect mother, the rock on whom we all depended taking all the demands of her children in her stride…” Memoirs of a Painter page 11. [iv] “Compulsive talking was a trait widely distributed among the Spencers. People told me that his mother had liked nothing better than to pass the hours, or days I fine, leaning on the garden fence gabbling endlessly.” A Private View of Stanley Spencer page 49. [v] Both houses and much of the locale survive. The Methodist Chapel which the family frequented is now the Stanley Spencer Art Gallery. [vi] Stanley Spencer. The Man: Correspondence and Reminiscences page 13. [vii] Stanley Spencer by his brother Gilbert page 34. [viii] Pople, Stanley Spencer page 521. [ix] From an oblique reference to Punch in Mosaic. [x] A Private View of Stanley Spencer page 29. [xi] Stanley Spencer by his brother Gilbert page 33. [xiii] Quoted in A Crisis of Brilliance page 185. [xiv] Quoted in A Crisis of Brilliance page 172. [xv] A Private View of Stanley Spencer page 20.